Lets face it, there hasn’t really been that much change in the audio arena for home theater in a while. Going from 5.1 to 7.1 was nice, but nothing to get too excited about. There are little things you can do to make your home theater experience better, like upgrade your screen, calibrate your displays and acoustically treat the room. They all make a difference, but nothing you can actually feel… What’s the next big thing to hit the home theater market that can take it to another level? Holographic displays are still a ways away… but tactile feed back is here today. I auditioned the Odyssee by DBOX, and have to say that it’s one of the greatest enhancements you can add to your home theater… the only limitation is the price tag. A few months back I posted about another new technology that can possibly give you similar results but for a fraction of the price tag. The product: Crowson Technology’s TES100. The kind folks over at Crowson sent me over a demo couch set to audition. The box was heavier than I expected. Inside were two TES Transducers that weigh about 3 1/2 lbs. each and two Vibration Isolators. They look of very high quality construction, down to the binding posts used. 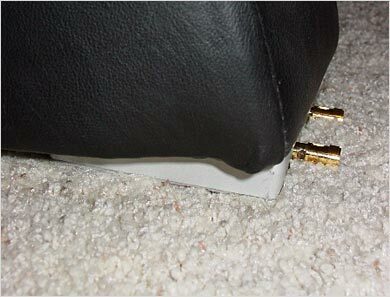 The installation of the unit is very simple, just place the transducers and vibration isolators under the legs of the couch. The reason Crowson can come in a bit just under $650 for a couch set is that they don’t require the use of any hardware other than a user supplied, two channel amp that is capable of producing a min of 50 watts per channel. The Odyssee system has an outboard controller that uses the audio track of the DVD for sync info, makes an Internet download of the tactile track and then controls the actuator. A pretty complex process, hence the hefty price tag. A drawback to the Odyssey package is that you can’t always enjoy the tactile feedback if the asset you are watching or listen to hasn’t been reproduced by DBOX. 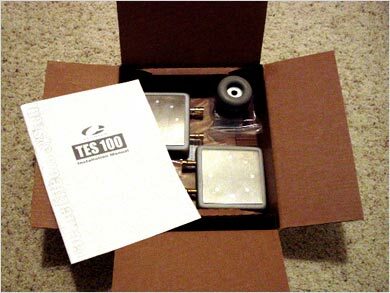 The TES100 works with any sound source since it uses the audio track’s low frequencies to actuate the transducers. My new dedicated theater isn’t fully completed so I had to set it up in my current set up. I used my old Yamaha 2095 100w per channel receiver (as my amplifier) to power the TES 100’s. Hook up was a cinch… I used Y connectors out of my Pioneer VSX-59TXi subwoofer outputs so I could continue to drive my subwoofer. After I got everything hooked up I turned on the system and popped in T2 and Jurassic Park DVDs. I was extremely impressed with the results. These units have enough power to shake the couch, and I’m not talking about a goofy shake… I’m taking about a nice tight vibration where needed and in sync with my subwoofer and the visuals on screen. You will need to adjust the volume on the amplifier connected to the TES 100 to suit your tastes, and depending on your mood and the movies you might be cranking it up or down. I was cranking it up… The TES 100’s do tend to heat up a bit during use, but that is normal since they are using the power to drive a magnetic actuator and the mass of your couch — and you (up to 1000lbs total), up and down. If you are looking to add a little excitement to your theater, you need to definitely check out Crowson Technology’s TES100! They are priced at $350 for a chair kit and $650 for a couch kit. 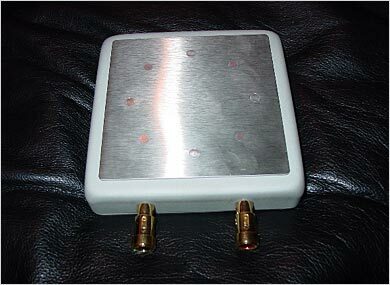 All you need to provide is a 50 watt minimum (per channel) amp to power the units. Crowson tells me that they are about to release their own A200 Stereo Amplifier (MSRP $350), designed specifically for the TES 100. Even if you can afford an Odyssee system, I would recommend you also pick up a set of the TES 100’s for when D-BOX doesn’t have the assets you want encoded for the Odyssee. For more information and to find a dealer check out http://www.crowsontech.com/. Shake, Rattle, and Roll… Part III. Shake, Rattle, and Roll… Part II.